What´s up with the community? There´s a absolute brilliant car made that cost less than a half of a lousy BigMac, made by a professional team like SimracingSystems and WE GOT ONLY 5 REGISTRATIONS for this. Even some of the oldest NRE members said NO to this. We got ONE series running well in the last 2 years, and that have been the first Porsche Cup. The second edition came and drivers started already to moan, that they do not want to race with the Porsche further on (of course they haven´t been that successful with it). Then some drivers wanted some kind of high downforce cars again. We introduced the brilliant Indy Lights Series, but the driver count at the registrations only reached 10 or 11 (haha if I would have known the registration count of the F79...). So we switched to the Kunos Lotus Exos 125 S1: The highest participation at a single race has been 10 drivers, and this has been the top of it because we didn´t got more drivers for this series. At the 6th and last race we only have been 5 drivers. The latest disaster now with the F79 Car: Most of us are mid-aged, so most of us are knowing the F1 from the 80ies and some also from the 70ies. This car got brilliant physics, a very good modelled car, brutal high quality sounds - a dream of a sim racing car. And we only reached 5 registrations, a new low-point here at NRE. 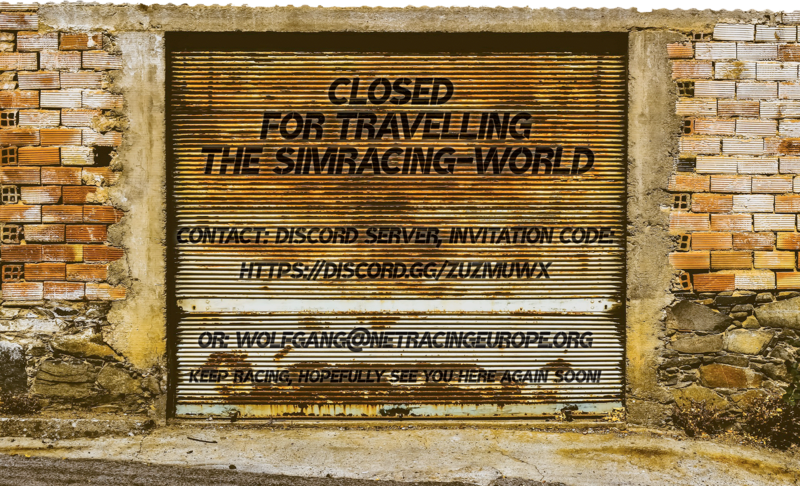 I think it´s time to make a break, if drivers do not want to race in a certain league, they should better do this elsewhere or close simracing. The site will remain as it is, the Discord Server will be there for further communications, BUT THERE WILL BE NO NEW SERIES for the moment. The Decision has been done: We will do our next season with the Formula 79 from RSS. It is a fantastic car and isn´t used widely for league purposes. This has been the primary reason to use this one. The car is available for only € 1,99 at RSS, registration is open now at our Discord Server. Check the rules and the schedule here at the page and be part of the challenge! The season has just been done and the planning for the next one are on the way. The only sure thing is that it will be an Open Wheel season again. The most promising car for a full field should be the Formula Hybrid, this needs to get checked. All I can say is that we surely will NOT do a season with that less drivers again. Wolfgang keeps his good flow - Harald keeps contact! Silverstone showed us a good performing Wolfgang and a calculating Harald. They finished 1st and 2nd, which rises the tension for the race in mexico: Both have to win this race if they want to get champion of the FLC. Could it be any better ;)? Stefan Nydegger was the 3rd driver at the podium already showing a quite big distance to the 2 front runners. Seems his switch at the shifting paddles cost him some performance, keep it up this way! Maik Rybak scored again 4th place, Bob Herps and Ronald Fuchs - who struggled pedal issues - got 5th and 6th. Unluckily Mika Behrens wasn't able to finish. Let's hope we get a decent field for the final race in mexico!